Two strikingly similar colors emanating from CMG 2016 ChromaZones® in Asia Pacific and Europe as 2018 color forecasts, illustrate the global reach of CMG’s forecasts. They emerge now, with various treatments, as important hues of simplicity, subtlety, and quiet. 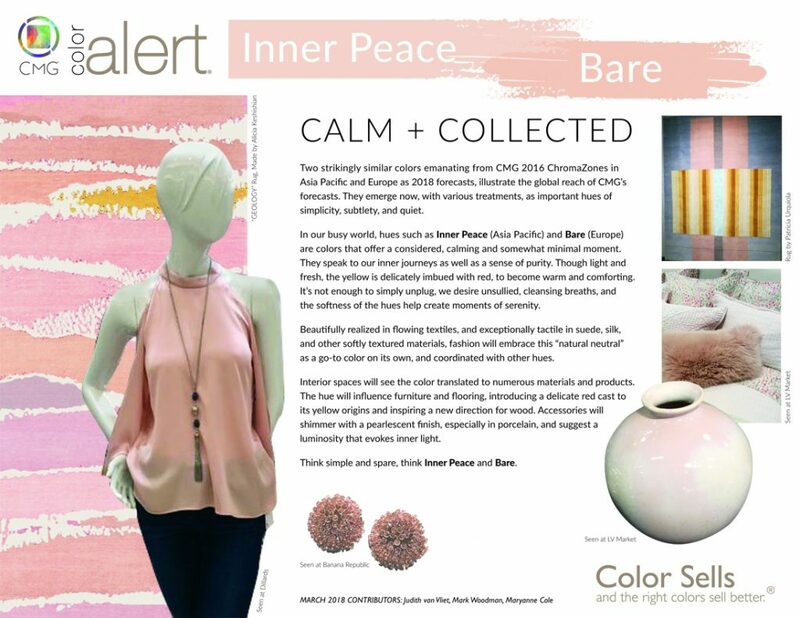 In our busy world, hues such as Inner Peace (Asia Pacific) and Bare (Europe) are colors that offer a considered, calming, and somewhat minimal moment. They speak to our inner journeys as well as a sense of purity. Though light and fresh, the yellow is delicately imbued with red, to become warm and comforting. It’s not enough to simply unplug, we desire unsullied, cleansing breaths, and the softness of the hues to help create moments of serenity. Beautifully realized in flowing textiles, and exceptionally tactile in suede, silk, and other softly textured materials, fashion will embrace this “natural neutral” as a go-to color on its own, and coordinated with other hues. Interior spaces will see the color translated to numerous materials and products. The hue will influence furniture and flooring, introducing a delicate red cast to its yellow origins and inspire a new direction for wood. Accessories will shimmer with a pearlescent finish, especially in porcelain, and suggest a luminosity that evokes inner light. Think simple and spare, think Inner Peace and Bare.